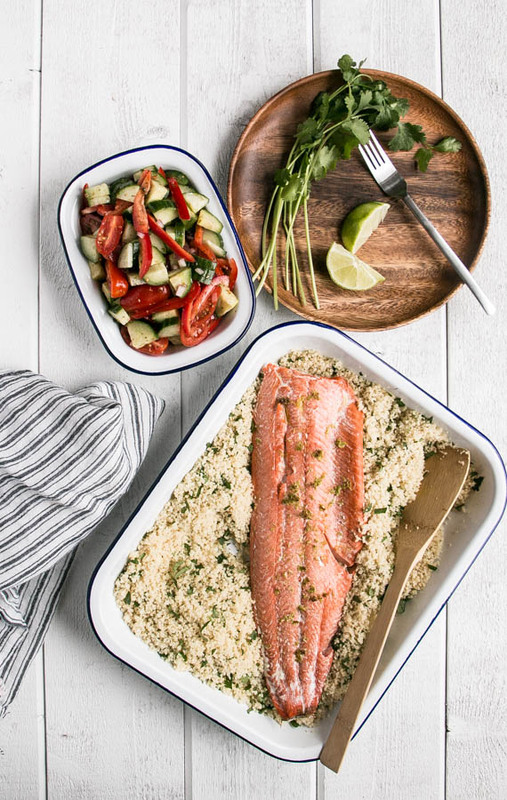 Healthy, quick, and easy 15 minute dinner of Broiled Salmon, Herbed Couscous and Salad, the whole family will love! A great easy dinner idea! One of the greatest discoveries in the carb department with my kids was how much they love couscous. Potatoes are still mostly a no go. Squash basically gets laughed at unless I purée it into the best carbonara sauce ever (like in this recipe). My husband is a more difficult sell for couscous, but my kids will always say “this is a yummy supper mama” when couscous is on the table. I often serve it with lamb or chicken, but here I have it with a quick cooking broiled salmon recipe and a get on the table stat salad. One of my girl-friends (hi Lindsay!) told me how to make salmon with this method after we enjoyed it for dinner at her place a long time ago. It was long before I was really into food (she’s an old friend), but the technique always stuck with me and makes for the best tasting salmon. It’s simply has lime zest on it and is broiled. That is it. Crazy right? SO good. It’s perfect for tacos or using a larger piece of salmon like the one shown here, it is fancied up a bit. It cooks in mere minutes making it the perfect quick weeknight supper. Not into couscous? Rice, quinoa or millet are excellent substitutions! This is my brainless everyone loves it salad. It’s cut up tomatoes, cucumbers, red peppers, and a couple of very small red onion pieces. Yes, it’s basically a Greek salad without the feta and olives. One of my kids refuses to eat cheese and sometimes we run out of lettuce so this is what happens. I cut up the veg while the couscous is resting and the salmon is broiling and lightly drizzle it with oil and vinegar. These vegetables are ones that everyone loves (and will generally eat naked and raw) so there really isn’t a need for true salad dressing. I jazz up the couscous by cooking shallots and using broth in there. This gives the couscous much more flavour depth than just using water. For Baby Lucy I generally take the couscous before fluffing it and create little pieces of couscous for her. She won’t really let us feed her any more so having the couscous in pieces (versus fluffed and loose everywhere) easier for her to pick up with her hands. Place oven rack 6" from broiler and preheat broiler to high. 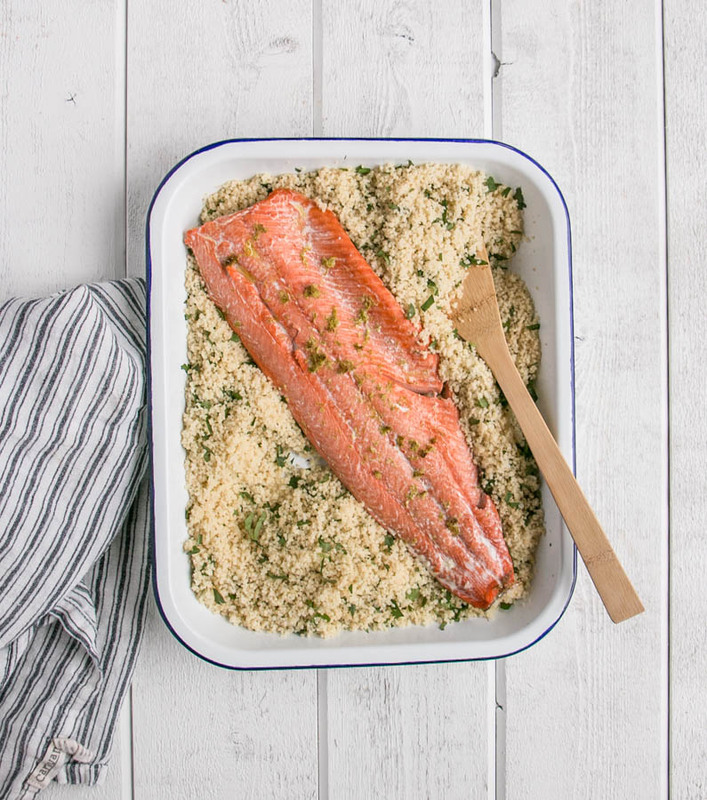 Place salmon on a rimmed baking sheet and sprinkle with lime zest. Broil for 6-10 minutes or until interior of salmon is extremely hot and salmon becomes flaky at the edges. Heat 1 tsp of olive oil over medium-high heat and cook shallots, stirring until starting to soften, about 2-3 minutes. Season with salt and pepper. Add couscous and broth. Bring to a boil and immediately cover and remove from heat. Fluff with a fork after 5 minutes and add chopped cilantro. 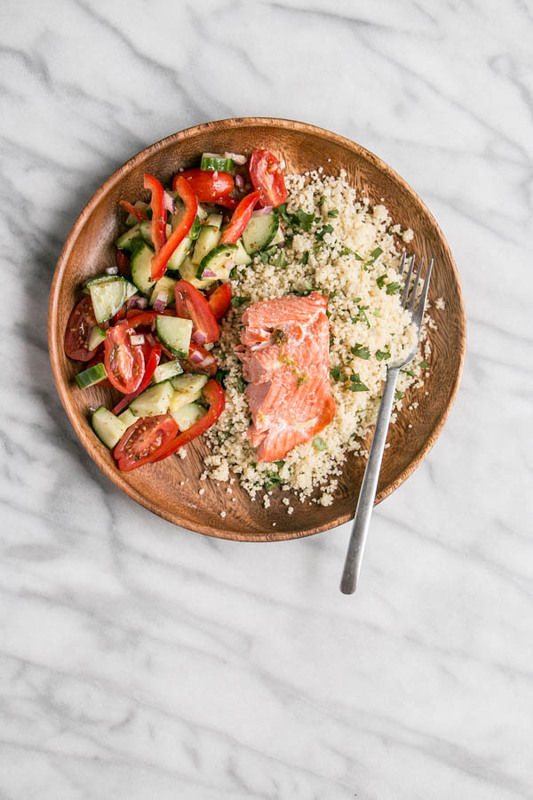 While couscous and salmon are cooking cut up all vegetables, toss together in a medium bowl and drizzle with vinegar, olive oil (no more than 1 tbsp for each of those) and add a dash of dried oregano (no more than 1/2 tsp). Season lightly with salt and pepper. This looks like such a delicious dinner! I should really eat more fish! I am ok with regular couscous, won't say no. But I loooove Israeli couscous! Have you tried it? It's a bit bigger, the size of pearls. There's a really nice mix that they sell at Costco that has Israeli couscous, lentils and orzo. We love Israeli couscous too! It feels like pasta and I often coat it in a veggie laden pesto. So yummy! I didn't know about that mix at Costco (I feel like you're the queen of Costco! Full of good tips!). Don't they all take different times for cooking though? I'll keep my eyes open for it - hopefully we have out west. I love easy dinners, so this 15 minute recipe is PERFECT! Especially since my husband loves salmon! Nice! It's great when easy dinners meet family preferences. Such a great recipe! Quick and easy all while being very flavorful. 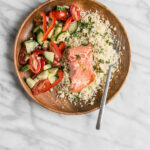 Salmon is such a great dinner and when it's paired with the salad and couscous, you can't go wrong. I couldn't agree more. It's still a family favourite.